My quest for an affordable version of active compression started after I raced in the Spring Classic Duathlon last March. If you are planning to be around Portland, Oregon at about that time of year, do check out this race. When the weather is nice, it swells into one of the biggest duathlons in the country and attracts upwards of 500 participants. For a duathlon, that’s massive! This year, the field was a bit small (a little over 200) but I managed to get 11th overall and won my age group. AA Sports always puts on classy events, but this race and their Blue Lake races in the early summer are their classiest events. After the race, I headed down to The Athlete’s Lounge in downtown Portland. They are kind enough to have a set of Recovery Pump compression leggings available for anyone to use. They also have a keg of free beer, but I couldn’t take advantage of that with a 3 hour drive back to Seattle facing me. Here’s a shot of me using the Recovery Pump thankfully before the long drive home. Active compression pumps all work on the same basic principle. 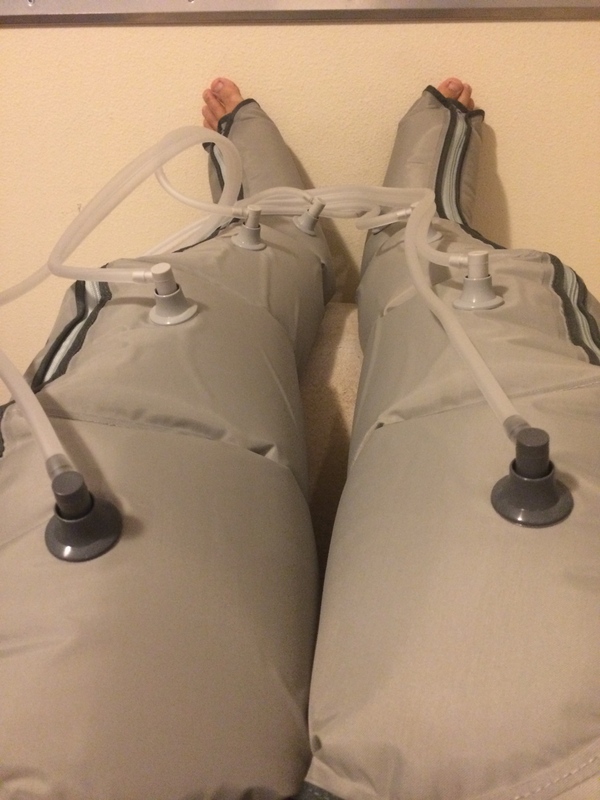 You put your legs in these long sleeves and air pressure squeezes your legs to force the blood and lymph out of your legs. Then, the pressure is released and blood flows back to your legs. 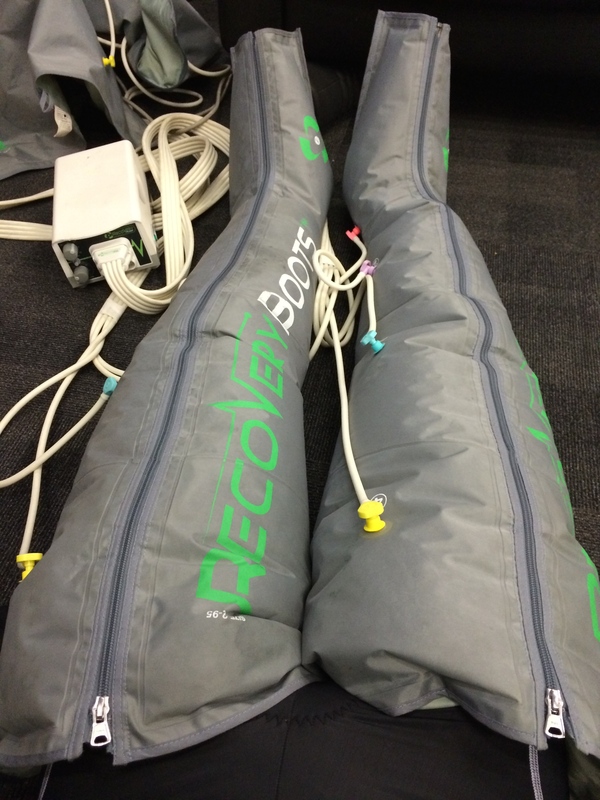 Any decent recovery pump offers this in a gradient compression– it starts by squeezing the toes and feet hard, then squeezes the calf, and so on up the length of your leg. I find that when I put my feet up (either lying down with my feet up or a chair or lying down with my feet up on a wall), these pumps become much more effective. None of this is new technology or anything specifically developed for athletes– these are basically rebranded lymphedema pumps and that technology has been around simply forever. The exception may possibly be Normatec, which uses a slightly modified version of compression– but at $1800, it wasn’t even worth considering. I found the object of my quest in the Revitapump LX7 on Amazon. It basically does everything that the Recovery Pump does, except for a lot less money. The picture at left shows me with my feet up using the Revitapump. Here’s my review off Amazon. I compete in lots of running and cycling events so my legs get pretty beaten up. I bought an LX-7 about a month ago after trying the Recovery Pump at the Athlete’s Lounge in Portland, OR. I also own and use a Compex EMS device and a set of prescription made CEP Clone tights. In the month that I’ve owned it, the LX-7 has become a regular part of my recovery routine. While the cost of the LX-7 is not insignificant, it is a far cry from the cost of a Recovery Pump ($1,400+) or a Normatec MVP ($1,800+). Having used a Recovery Pump, I can tell you that it’s a great device and works well, but it’s probably not worth the $1,000 extra dollars when the LX-7 does almost exactly the same thing. I’ve never used a Normatec and I’m sure that the peristaltic massaging action it uses is a great feature, but again the price difference is just too wide to even consider such an expensive unit. The LX-7 is a fairly powerful unit with decent build quality. Turned up all the way, it produces a lot more power than Recovery Pump. The downside is that it doesn’t cycle nearly as fast, taking a full 80 seconds to run through a full cycle. The build quality is pretty comparable, maybe a touch lower. The Recovery Pump is definitely medical equipment (it is a rebranded hospital lymphatic pump) while the LX-7 seems more focused on the consumer market. The Recovery Pump is far more portable, but if I had to travel I’d take my Compex over any of these devices any day of the week. Lastly, I think that the “massage action” setting on the LX-7 is pretty useless—not quite like the peristaltic action on the Normatec because it releases pressure in the lower airbag units as it move upwards (by contrast, the Normatec keeps some pressure in the lower units instead of releasing it entirely). Bottom line: unless you have a ton of extra cash, save your money and buy the LX-7 instead of the more expensive units. So how does this compare with my other forms of recovery? I really love my Compex and I think the active recovery setting is about as close to a massage as I can get without actually getting one. In fact, I think it might actually be better than a massage, in the sense that a massage sometimes leaves my legs feeling a tad flat. It’s a real hassle to set up, however, and also can cause some skin irritation (e.g. don’t scrub the skin too hard before using it) and can work on only a few muscle groups at a time. I also find that using the Compex “endurance” setting for a couple of weeks useful for avoiding the burning legs feeling on long climbs. But, all in all, I much prefer the convenience of using the LX-7. It’s just so easy to set up and use—and it always feels great (never any irritation). The LX-7 also works really well with my CEP Clone tights. If you can only get one, I’d say go with CEP Clone. While “active compression” devices (like the LX-7) work much better than “passive compression” (like compression tights), the benefits of both stop when you stop using them—and you can wear passive compression much longer under clothes. But passive compression only works if it is the right pressure—and that takes lots of precise measurements like the 41 body measurements that go into getting “cloned.” The perfect recovery combination, of course, is to use both CEP Clone (during the day) after using an active compression device like the LX-7. BTW, if you search the internet researching this device, you’ll certainly come across identical reviews by “Neil Westlake,” who clearly works for the manufacturer or importer. His reviews are copied-and-pasted into every site that talks about compression pumps is done in really bad taste. Don’t be put off—it’s a useful device nevertheless. Now that I’ve had a whole season of using active compression, EMS, and passive compression, this is when I use each one. I use EMS when I travel (because of its small size) and when my legs are really trashed. For some reason, it’s also easier to use when the weather is cooler. I use active compression on a more consistent basis in the warmer months when I’m at home. I use passive compression (CEP Clone) all the time when I’m doing work or traveling, but my usage definitely tapers off in the summer time.